A hugely-popular tourist driving route faces disruption while a stretch is used to transport nuclear waste. 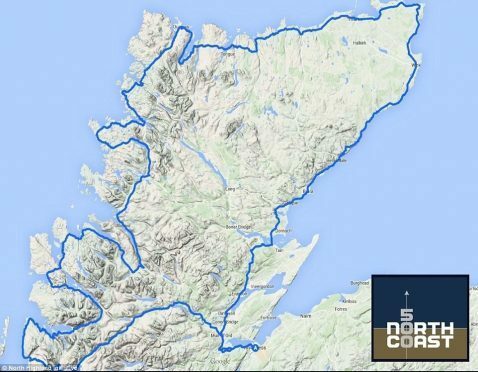 With the UK terror threat remaining “severe,” police have been granted the power to close a nine-mile stretch of the lucrative North Coast 500 route for public safety reasons. The move is to allow shipments to be transported along the A836 from the Dounreay atomic plant in Caithness to the port of Scrabster – then on to Sellafield in Cumbria. The sporadic A836 closures will be for one hour at a time between Monday, June 17, 2017 and June 22, 2018. Motorists will be diverted onto an unclassified alternative route taking them via Shebster and Westfield, to the south. The interruption will take trippers away from the coastal route and close to the giant Baillie Windfarm and a string of huge pylons. David Richardson, regional spokesman for the Federation of Small Businesses which represents many tourism-related operations in the far north, said the impact needed to be carefully considered. And he questioned whether road was the best method of transporting the convoys, whether they should happen during the summer season and why they had to happen during the day. He said: “Closing the road might seem simple but if it leads to congestion or delays, that can damage the enjoyment of visitors especially if they’ve got a ferry to catch, for example. “Tourism is on the up. Nevertheless, the future is uncertain and businesses know they can’t be taken for granted. No-one was available for comment yesterday at either the NC500 offices or at VisitScotland. Local councillors say the diversions should not undermine the appeal of the lucrative tourist draw. Until now such loads from Dounreay, which is being decommissioned, have not required such road closures on the NC500 route. But in a period of unprecedented security, a decision was taken by the security sevices to close the road as deemed necessary. Thurso-based anti windfarm campaigner Brenda Herrick expressed concern about the impression on people who travel long distances to experience wild landscapes. She said: “I think these convoys will prove quite off-putting.